A cowboy who wants to be a preacher. An outlaw's daughter who wants to change his mind. On his way to interview for a position at a church in the Piney Woods of Texas, Crockett Archer can't believe it when he's forced off the train by an outlaw and presented to the man's daughter as the preacher she requested for her birthday. He's determined to escape--which would be much easier if he could stop thinking about Joanna Robbins and her unexpected request. For months, Joanna had prayed for a minister. A man to breathe life back into the abandoned church at the heart of her community. A man to assist her in fulfilling a promise to her dying mother. But just when it seems her prayers have been answered, it turns out the parson is there against his will and has dreams of his own calling him elsewhere. Is there any way she can convince Crockett he ended up right where he was supposed to be? 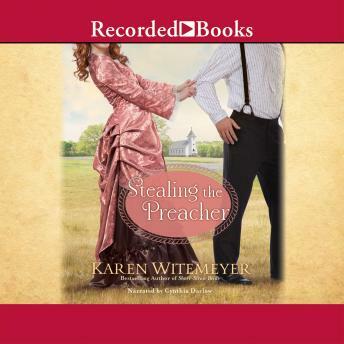 With her signature blend of humor, history, and lively western romance, two-time RITA Award finalist and bestselling author Karen Witemeyer delivers a Texas love story sure to steal your heart.